Available round the clock and focused on caring for hearts every day of the year, the Paul B. Hall Regional Medical Center chest pain center team knows the warning signs and delivers rapid treatment to patients in the early stages of heart attacks. Early intervention and attention reduces strain on the heart and creates better outcomes. In addition to helping us provide quality care to patients with heart issues, this pinpoint focus also helps prevent unnecessary admissions if it’s not clear if a person is experiencing a coronary event. Heart attacks are a leading cause of death in the U.S . Know the symptoms and don’t wait; if you think you’re having a heart attack, call 911 immediately. Chest discomfort/pain, may perceive more as pressure or tightness than actual pain. Uncomfortable pressure, fullness, squeezing, or pain in the center or the chest lasting several minutes or despite use of nitroglycerine. Chest discomfort spreading to the shoulders, neck, one or both arms or jaw. Chest discomfort spreading into the back or between the shoulder blades. Chest discomfort with dizziness, being light-headed, fainting, sweating, nausea and/or vomiting. Unexplained, sudden shortness of breath, with or without chest discomfort. Sudden change in mental status. 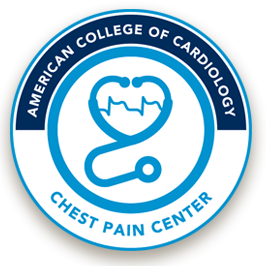 The Chest Pain Center at Paul B. Hall Regional Medical Center focuses on the rapid identification and diagnosis of heart attacks. Rapid response can mean the difference between permanent heart muscle damage and complete recovery. Our skilled cardiac care team is on duty 24 hours a day, seven days week. As a designated Chest Pain Center by the American College of Cardiology in collaboration with American Heart Association, our goal is to significantly reduce the mortality rate of heart attack patients by teaching the public to recognize and react to the early symptoms of a possible heart attack, reduce the time that it takes to receive treatment and increase the accuracy and effectiveness of treatment. Our protocol-driven and systematic approach to patient management allows physicians to reduce time to treatment during the critical early stages of a heart attack, when treatments are most effective. The American College of Cardiology's accreditation process insures centers meet or exceed quality-of-care measures in acute cardiac medicine. When patients enter the Emergency Department at Paul B. Hall Regional Medical Center, the time of their arrival will be noted. Our pledge is that a clinical professional (physician, physician assistant or nurse practitioner) will work diligently to have our patients initially seen within 30 minutes of their noted arrival. Whether it is a minor injury or a life-threatening illness, the staff of Paul B. Hall Regional Medical Center’s Emergency Room is ready to serve you and your family 24 hours a day...every day! When you have a medical emergency, time is a precious commodity. At Paul B. Hall Regional Medical Center we know the value of time. We also know the value of a physicians and nurses who have the training and experience required in a modern emergency room. At Paul B. Hall Regional Medical Center our Emergency Room is staffed by specially trained, experienced physicians 24 hours a day, as well as qualified nurses who are on duty around the clock. These medical professionals are dedicated to examining, diagnosing and treating medical emergencies as professionally and as quickly as possible, consistent with the needs of others. Our emergecny service is coordinated by a Nurse Supervisor and a Triage Nurse, in consultation with the on-duty physician. The word “triage” means that a qualified, experienced medical professional will see that the patient with the most life-threatening condition (classified emergent) will be seen immediately. In some instances, this may mean that a person with a cold, fever or minor cut (classified non-urgent) may not be seen immediately upon arrival. Similarly, patients with lacerations, higher fevers, overdoses and fractures (classified urgent) may have to be seen before the non-urgent but after the emergent. It is a hospital’s way of assuring you that the most serious medical conditions will receive the attention they deserve...based on the medical priorities at the time the patient arrives. Paul B. Hall Regional Medical Center’s Emergency Services Department sees more than 500 patients each week. Even with this high volume, you are assured of quality medical care rendered in a timely manner with a caring concept. At Paul B. Hall Regional Medical Center, the ER staff knows that time is of the essence when an injury or illness needs immediate attention. Likewise, we know that a patient’s time while at the hospital is also important. In addition, the stress and anxiety of both the patient and the family are very important to us. The average time a patient will spend in our ER – from registration to discharge –is approximately an hour and 40 minutes. Longer than you would like to stay, we know, but significantly shorter that that experienced in some other hospitals. Paul B. Hall Regional Medical Center’s Emergency Room has the only designated pediatric trauma room in the area, with scaled-down equipment, instruments and drug dosages for children and infants. This room was designed with the pediatric patient in mind. In addition to our qualified staff and spacious treatment rooms, our ER is equipped with state-of-the-art equipment which permits our staff to make informed immediate decisions on the care and treatment required and better monitoring of this care. With the PRO-MED on line data system, based on national standards nurses are able to immediately order necessary tests. The department is also equipped with datascopes, allowing better vital statistic monitoring for current and future patient care. However, in the final analysis it is the personal touch – a caring, concerned staff of local professionals who know and live among you and your family – which makes the difference in a medical emergency and the treatment provided at Paul B. Hall Regional Medical Center. That’s why we are HERE...for YOU, YOUR FAMILY and YOUR HEALTH! Sepsis is your body’s overwhelming response to infection or injury, which can lead to tissue damage, organ failure, amputations, and death. Sepsis is more likely to affect very young children, elderly, and people with chronic illnesses or weakened immune systems. If you have a combination of these symptoms, especially if you have had recent surgery or a recent infection, see your physician immediately, call 9-1-1, or come to Paul B. Hall Regional Medical Center’s Emergency Room. Sepsis is caused by an infection. The infection can be viral, bacterial, fungal, or parasitic. While Sepsis can’t always be prevented, practicing good hand-washing and staying current with vaccinations (i.e. influenza and pneumonia vaccines) have been proven to decrease the risk. • Sepsis affects over 30 million people worldwide each year. • The risk of dying from sepsis increases by 8% each hour treatment is delayed. • 270,000 people die in the United States each year from Sepsis (One person every 2 minutes). Sepsis is a Medical Emergency. If you suspect Sepsis, call 9-1-1 immediately. When you have a medical emergency, you count on the team at Paul B. Hall Regional Medical Center. We offer 24-hour emergency room services led by trained emergency medicine physicians who are supported by compassionate medical and professional staff. Our emergency room is easy to access and features comfortable surroundings. We are backed by the full resources of an integrated health system offering the latest medical technology and diagnostic capabilities for adults and children.